Teratogens are agents that disturb the development of the embryo during pregnancy. A number of drugs are known to be teratogenic to the human embryo during pregnancy. Many of these teratogenic substances have been studied in animal studies and in human epidemiological studies. Some of the effects of these teratogens may be present later in life, in infancy, or immediately after birth. Typically, teratogens that affect the central nervous system (CNS) will display their effects quite early in the development of the child. Alcohol has been identified as a very serious teratogen that affects the CNS and other aspects of development. 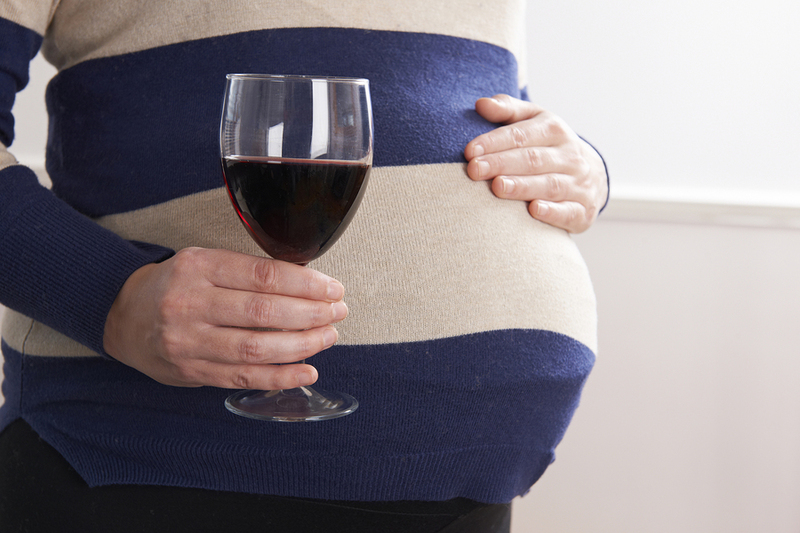 This article will discuss some of the detrimental effects of using alcohol during pregnancy. Despite a number of conflicting reports and reviews reported in the media, all major health organizations, such as the Centers for Disease Control, World Health Organization, National Institute of Health, etc., maintain that there is no established safe level of use of alcohol during pregnancy or when a person is trying to conceive. There is no safe time for a woman who is pregnant to drink alcohol. Moreover, different types of alcohol are equally potentially dangerous, including some of the more “soft” drinks, such as beer and wine. Any time a woman who is pregnant uses alcohol the baby is exposed to alcohol as well. There is no avoiding this. Many times, women who are pregnant may not know that they are pregnant and may use alcohol. According to the organizations listed above, often women do not know they are pregnant until 4-6 weeks after conception. Thus, in order to protect the fetus, women who are planning to get pregnant should not use alcohol at all. Any woman who finds out that she is pregnant and has consumed alcohol should stop using alcohol immediately and consult with their physician. Some of the effects of alcohol use during pregnancy are outlined below. Delays in reaching developmental milestones, such as walking, toilet training, talking, etc. The results of FASDs are irreversible, and individuals with this syndrome will typically need special assistance in some areas throughout life. The range of deficits associated with FASD can be mild to extremely severe. Approximately 6-10 percent of children exposed to alcohol in the womb will develop FASD. At this time, there is no way to predict what factors make certain children more vulnerable to the development of the syndrome than others or what makes certain mothers more likely to have children with FASD than others. Research indicates that there are genetic susceptibilities in both mothers and children that make them more vulnerable to the development of the syndrome; however, these susceptibilities cannot be used to make a definite determination of risk in any single individual. Thus, any alcohol use during pregnancy should be strictly avoided. Neural tube defects: Neural tube defects are defects that occur at birth that affect the brain or spinal cord. These defects occur as a result of some insult to the neural tube (the part of the embryo that develops into the brain and spinal cord) that occur in the first month of pregnancy. For many women, this is a period of time where they are not even aware they are pregnant. Common neural tube defects are outlined below. Anencphaly is a condition where the brain and spinal cord did not develop correctly. Most of these infants die soon after birth or are stillborn. Spina bifida is a condition in which the fetal spinal column does not fully form. This can lead to issues such as partial paralysis of the legs. Chiari malformation is a condition where brain tissue extends into the spinal cord. This can result in a number of developmental and cognitive issues. Cardiac issues: About one-third of children with FASD will also have malformations of the heart. These congenital malformations are usually in the ventricles or arteries, and they can be quite serious, resulting in the child having cardiac issues that will remain permanent. There is also a high potential for the development of minor cardiac issues that are not related to structural cardiac defects associated with alcohol exposure. Issues with the renal system: Alcohol use by a pregnant mother has been associated with a number of issues with the kidneys of the child. Pregnant mothers using alcohol can subject their child to the potential of maldeveloped kidneys (hypoplasia), resulting in a number of issues with the renal system or a condition called bilateral renal agenesis where the baby is missing both kidneys altogether. A number of other issues as a result of fetal exposure to alcohol can occur, including miscarriage, stillbirth, issues with growth, mild cognitive issues, mild decreases in IQ, and other mild developmental issues. Children exposed to alcohol in the womb are at higher risk to have developmental issues with all in systems and with the skeletal structure of their bodies. Even if a child is not formally diagnosed with a FASD disorder, exposure to alcohol in the womb may result in a number of subclinical developmental issues (issues that are not fully diagnosable as clinical disorders but represent mild deficits in various areas of functioning). All of the major health organizations mentioned above list fetal alcohol exposure as one of the major preventable causes of developmental and birth defects in the United States. Individuals reading this article may develop the impression that drinking so-called “nonalcoholic” wine and beer is a viable alternative. However, the majority of these substances do contain small levels of alcohol and, as mentioned above, there is no universally agreed-upon safe level of alcohol that a pregnant mother should or could drink. Thus, women who are pregnant or intending to get pregnant should not knowingly consume any substance that contains any level of alcohol. A fair number of women do not find out that they are pregnant until 4-6 weeks following conception. If a woman finds out she is pregnant and has been actively using alcohol, it is important not to panic. Halt any further use of any alcoholic substances. As suggested above, make an appointment with a physician as soon as possible to monitor the development of the child and avoid the use of alcohol and other drugs for the remainder of the pregnancy. In most cases, the pregnancy will progress normally.